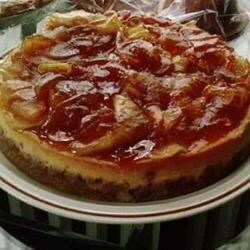 "Caramel apple meets cheesecake in this recipe that gives you a neat twist on either dessert ideal for an autumnal dinner!" Preheat oven to 350 degrees F (175 degrees C). Reserve 3/4 cup of apple pie filling and set aside. Bake at 350 degrees F (175 degrees C) for 35 minutes, or until center is set. Remove from oven and cool to room temperature. I followed the directions exactly. Didn't care for it too much, I guess I was just expecting something a little different. Other people who tried it seemed to like it though.